Leading edge technology for successful and productive breeding, designed especially for parrots eggs incubation. Emulation of the natural heat, moisture and egg rolling conditions, combined with an elegant, convenient, easy-to-use design creates a highly efficient & save on energy product, suitable for every breeder, professional and amateur. The incubators are well isolated and operating within a large range of ambient temperatures; between 18-30 Degrees Celsius. 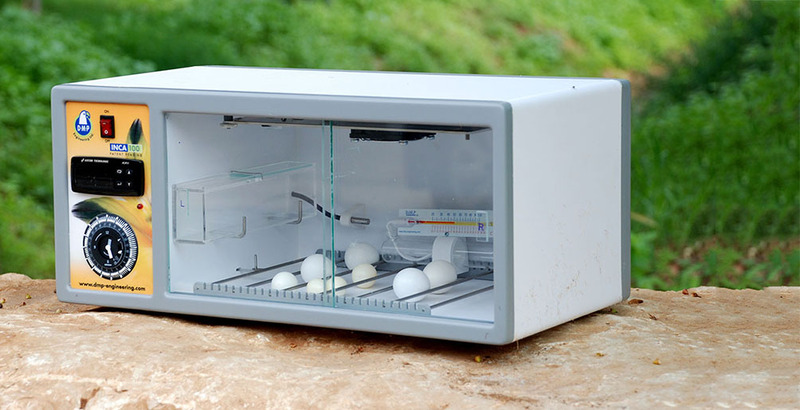 Exclusive Heating Technique – a large surface heating-plate mounted on the incubator’s top and heats close to the brooding mother’s temperature. The centered fan causing the air to heat up and to descent evenly on the eggs below. Clear Digital Display – an electronic controller allows the temperature to remain at the desired level and monitors the heating-plate as well. A digital display provides the user with real-time information about the temperature inside the incubator. a sliding conveyor with rigid metal wires. – The eggs lay between the wires, on the incubator floor, and the conveyor’s movement causing the eggs to roll. The spaces between the wires can be adjusted according to the size of the eggs. therefore it saves the usage of a hatcher. Manual Humidity Control – for achieving the best hatching results, a suitable level of relative humidity is required at all times and for that, a water container is placed inside the incubator. Humidity regulation is done every few days by closing and opening the movable glass lid on the container’s perforated top. The transparent container can be easily removed for refilling with water or for cleaning. Temperature\Humidity Meter – for adjusting and monitoring the relative humidity inside the incubator. Maximum Visibility -sliding transparent glass doors for convenient monitoring of the egg incubation process. Can be lifted out easily for the purpose of cleaning. Easy Maintanance – the incubators, constructed out of rigid P.V.C, were designed for easy cleaning and optimal disinfection with no hidden spots for bacterial growth. Every part is accessible and can be quickly dismantled including the heating plate and the egg conveyor.